Great questions, Mrs Garbutt. As I'm sure you're aware, Quinoa is regarded as something of a 'super' grain. It gains this status through its ability to cause consumers to talk exclusively about how much they enjoy eating quinoa and how great it makes them as a person in general. It remains puzzling, therefore, that quinoa would be included in a foodstuff aimed exclusively at those who are yet to gain the neuronal power of speech, and thus are immune to its great benefits. It's not just the quinoa, however, that warrants note here. I was initially intrigued by the inclusion of purple carrot, instead of the more common orange variety. However, my research has led me to the conclusion that actually, prior to the 17th century, most, if not all carrots were of the purple variety. This lends Only Organics' food extra hipster credential, by the inclusion of carrot in its original form prior to it becoming the popular vegetable it is today. This is carrot from when it was still underground. Add in the famed antioxidant properties of blueberries, and some disappointingly boring pear, and I suppose you have the perfect blend for health conscious 4-6 month olds. Initial thoughts: The deep red/not quite maroon colour that greeted me at first squirt was not quite as expected, but not an unpleasant looking paste to consider putting in ones mouth. Emily's reaction: this was second, nay, third offering for this meal. An initial course of home-puréed avocado (brief review: it looked, smelt and tasted like avocado) added to the super-foodiness of dinner, but was swiftly rejected by Emily. A brief interlude for breast-hydration was followed by a second sitting for solids. Emily's enthusiasm for the red purée was easy to see, and several missives to hurry up with the spooning were forthcoming. However, a recently breast-fed tummy can only take so much, and half a packet was left for my tasting purposes. Taste test: My initial thought was that this was a slightly thicker purée than the more established Watties offerings on the market. A slightly granular texture was evident on the tongue: at first I thought this to be the fabled, much publicised quinoa. On rolling the product around the mouth, I feel the pear to be the more likely culprit here. The initial taste is of the blueberries, strong on the palate, with a hint of pear. On holding in the oral cavity, a hint of carrot is revealed: whether a difference is made between this being of the hip purple variety, or whether a more widely recognised orange root vegetable would have given a similar sensation, I am unable to say. I was disappointed not to detect the nutty tones of the heavily advertised quinoa, but maybe the more refined buds of a resident of the Aro Valley, or other indigenous quinoa consumers would have more luck. Almost as an afterthought, a slightly tart note of lemon juice (from concentrate) lingers. All together, not an unpleasant experience at all. Overall: 7.5/10. Pleasant, but for the reputation of the ingredients included, I was expecting much greater things. One to conspicuously feed your baby at Parnell Coffee Group. Enjoy: As part of a healthy spirulina smoothie before heading out for a big session at the CrossFit gym. 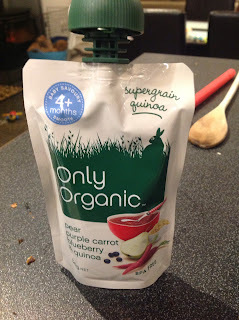 Have you got a favourite baby food you would like me to review? Post in the comments, or twitter me at @lukeurmyson! I'll be sure to bring one of these sachets for Olive to enjoy with her fluffy next time we're down at the hipster cafes of St Clair. Looking forward to hearing your thoughts on Watties vanilla custard.